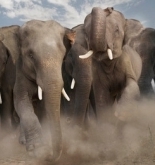 Since Elephant Watcher switched over to general election coverage, we have written numerous posts about potential campaign strategies for both Barack Obama and Mitt Romney. Obama's campaign strategy--both his optimal one and the ones he's tried out so far--revolve around being negative. Since voters are dissatisfied with Obama's presidency, and since it's not possible to make them become satisfied with his presidency by November, Obama's only hope is to destroy Romney and leave voters with no alternative. Obama's potential strategies, therefore, differ only in the methods by which he attacks Romney. Romney's situation is almost the mirror opposite. Because voters have already decided they disapprove of Obama's handling of the economy, Romney doesn't want to change voters' minds about Obama--and he probably couldn't if he tried. And since Obama is already president, the baseline questions of what kind of president he would be are moot, leaving Romney little incentive to attack Obama's character. Voters are unlikely to shift their opinions about Obama too much in either direction. They have already decided they want change; they just need a credible alternative. If Romney's task is to present himself as a credible alternative to Obama, how should he go about doing it? First, Romney needs to avoid pitfalls and unforced errors that would disqualify him. Second, Romney needs a positive campaign about himself. Every campaign involves both positive ads and negative ads. Negative ads are the mudslinging attack ads that can become famous or infamous each election year. Positive ads are the "feel good" ads that a candidate runs about himself to advertise his credentials and positive qualities. It should be no surprise that Obama will focus on creating negative ads about Romney. Romney will to use negative ads too, but he'll also need to put a focus on positive ads. At present, most voters know little about Romney. His national profile consists of his 2008 and 2012 runs in the Republican presidential primary. But not too many voters actually pay much attention to primary campaigns. They'll note the results of the contests, perhaps, but unless they're in the political party of the primary and their state is hotly contested, they won't see much of the primary campaign itself. For example, only a small percentage of the general election voters casting ballots this November will have watched Romney's performances in the Republican primary debates. If voters don't know much about Romney, how can they see him as a credible alternative to Obama? They can't. That's what positive ads are for. Note that the big-spending SuperPACs tend to run negative ads rather than positive ones. This means Romney's campaign itself will need to flood the airwaves with positive ads; they can't rely on outside sources. So far they haven't done this. By contrast, both the Obama campaign and his SuperPACs will be able to make an impact with negative ads against Romney. This disparity may be one of the reasons Romney has not achieved a real breakthrough in the national polls thus far. But there's some good news for Romney. Voters begin paying close attention to the general election campaign beginning with the parties' national conventions, which will start in late August. The Republican national convention will be, in essence, a very big, expensive, highly-watched positive ad for Mitt Romney (and his VP nominee). At the national convention, the opponent will come under some attack, but the conventions tend to be positive. They tell the life story of the candidate and showcase the reasons why he should be president. Thus, only after the Republican convention will we be able to say that most voters are familiar with Romney. That's when poll numbers will become more telling. In addition, the presidential debates held in October have the potential to serve as positive ads of a sort for the challenger. (If a candidate does poorly, they become like very effective negative ads.) If the challenger is put on the same stage as the incumbent president and he does well, the challenger is basically given free, positive advertising that says "this man is a credible alternative." It's ironic that an incumbent president would need to go on the offensive, while the challenger is on the defensive in the sense that he needs to build himself up. This isn't always the case, but when the economy is in unusually bad shape and voters want change, that's the position they're in. With the convention and the debates, Romney has two big opportunities to make gains. Since Obama lacks equivalent opportunities, Romney is in better shape than the polls will suggest--until the conventions. Despite the heat taken by Mitt Romney from all the Bain Capital attacks, the Intrade market on the 2012 race is holding steady, almost unchanged over the last two weeks. The market gives Barack Obama a 56.2% chance of winning reelection, with Romney at 43% to win. This margin of 13.2 points is actually narrower than the 14.9 point lead enjoyed by Obama when we last checked in, at the beginning of July. How can we explain the Intrade investors' behavior? The numbers appear to confirm the hypothesis that this particular Intrade market reacts almost exclusively to the polls, specifically, the RealClearPolitics average of national polls. The RCP average is similar to what it was earlier this month--perhaps even showing a slightly closer race. This shouldn't imply that the Bain narratives will have no effect, however: Little polling has been done since the latest Bain attacks captured the headlines. The power of the RCP average rests in the fact that it is widely read and very simple: It's just an average of the most recent national polls. RCP does nothing to account for the difference between registered voter and likely voter polls, though it does limit its use of daily tracking polls. If the RCP hypothesis is correct, we can expect that big campaign stories will have minimal impact until they are reflected in the poll average--and poll averages necessarily lag behind events. Only a truly obvious shift in the campaign should be able to overcome this, such as a clear win in the debates or a massive scandal. Meanwhile, the Intrade market on the Republican VP nominee has changed in the past two weeks. Rob Portman still has the lead at 29.1%, but Tim Pawlenty has made a comeback to 23.8%. Pawlenty's comeback appears to have been triggered in part by an item on The Drudge Report about Romney having already made his VP decision; the headline linked to a story about Pawlenty. Minor players in the VP market have also shifted. Marco Rubio is down to 9.1%, while Bobby Jindal and Paul Ryan are up to 7.2% and 6.9%. Condoleezza Rice has jumped from almost nothing up to 6.0%. It's likely that Rubio's fall was the result of the gain by the latter three contenders, who may be viewed as sort of "risky" picks, like Rubio. As with Pawlenty, the Rice gain was driven by an unsourced item in Drudge suggesting that Rice was a surprise frontrunner among the potential VPs. The Rice market went to 15% before the storm died down. The Intrade market remains skeptical about Rice because she has so many weaknesses: She is associated with the George W. Bush administration, especially its most unpopular policies (the war in Iraq, torture, etc.). Chris Christie, who once had been one of the frontrunners on the Intrade VP market, has completely collapsed to 1.8%. In part, that may be due to the fact that others have been speculated about in the media more than Christie has of late. The most recent crash was probably also precipitated by yet another item in Drudge, which showed Christie in an angry altercation with a random passerby on the New Jersey boardwalk. Christie's chief weakness, particularly from a "Romney perspective" has always been his perceived volatility. Last month, Barack Obama's campaign essentially abandoned its attack line against Bain Capital, the private equity firm founded by Mitt Romney. The attacks against Bain had fizzled because they were delivered as attacks against private equity firms in general. Prominent Democrats rejected the idea of attacking private equity and, as in the Republican primary, Romney was able to defend himself by trumpeting Bain's successes. Given the lack of controversy about the facts surrounding Romney's timeline, Obama's attacks had little substance. Obama erred by overreaching, but Romney played into Obama's hand through the unforced error of lending weight to the attacks' importance. This may be considered the first time Romney's campaign has made a serious blunder during the general election campaign. Several days ago, Barack Obama took the lead in the polls. The trend was in Obama's favor, but after a brief time, the national general election polls swung back in Mitt Romney's favor. The two candidates are virtually tied; even when the numbers were at their best for either Romney or Obama, the polls showed a dead heat. Both candidates can promote spin about how the closeness of the race suggests weakness on the part of the other candidate. Considering how poor the state of the economy is, and considering how unpopular Obama's legislation has been (e.g. Obamacare), one might say the closeness of the race proves Romney is weak. After all, when voters disapprove of the economy, it should make things easy for the challenger. On the other hand, Obama is an incumbent. His challenger went through a bruising primary campaign in which the Republican Party eagerly sought an "Anti-Romney" wherever they could find one. Romney lacks charisma, his own party doesn't like him much, he hasn't chosen a vice presidential nominee yet, and he has been subject to attacks by the media and his opponents in both parties. By that measure, the closeness of the polls suggests weakness on Obama's part. As is usually the case, the spin on both sides contains elements of truth: The economy is weak and voters are ambivalent at best about Obama; Romney is a weak challenger and has so far been unable to unite or excite his party. Perhaps the reason why the polls continue to gravitate toward a tie is that the two candidates' weaknesses cancel each other out. But is the race destined to be a stalemate? Not necessarily. As we wrote earlier, the general election won't really begin for awhile. Voters will begin to pay some attention when Romney selects his VP, and they'll tune in once the parties' conventions take place beginning August 27th. Until then, the race won't fully take shape. Voters' attitudes toward Romney will be particularly difficult to register, since they won't see him in action or even know much about him before the Republican convention. After both conventions finish in early September, polling data will become more useful. The race may still be deadlocked, but it may not. If voters continue to be unhappy with Obama, and if they are convinced that Romney is a decent alternative, the polls could swing in Romney's favor. Even after the race takes shape in early September, the October debates between the candidates will have the potential to swing the race in either direction; we have seen that historically, the debates matter. Even so, the "starting point" also matters. Each candidate's starting point won't become clear until the conventions. On July 1st, Barack Obama took the lead for the first time in the Elephant Watcher average of national general election polls. The average is comprised of the ten most recent polls, adjusted for the difference between registered and likely voter polls, and with daily tracking polls added once every three days instead of daily. The polling data and (including the older polls) used to create the chart below may be found on the Polls page. The poll average chart enables us to track the movement of the race at a glance, beginning from the end of May 2012. Note that the race has remained very tight: The poll average has always been within a range of about three points, from half a point in Obama's favor to a little over two and a half points in Mitt Romney's favor. 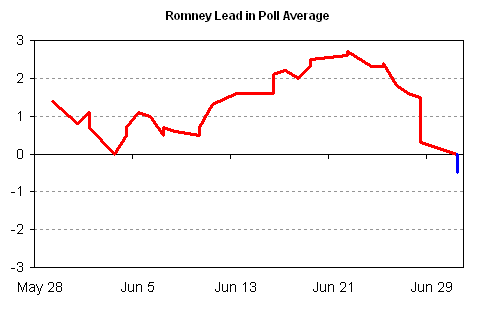 Romney began with a slight lead, which slowly built up to a peak of 2.7 points on June 22nd. During the ten days after that, his lead fell fairly swiftly. Obama now holds a lead of half a point. It's the first time Romney has lost the lead, though the two candidates were tied briefly in early June. For much of June, Romney appeared to have the momentum. What accounts for the shift? Let's start by ruling out some possible explanations. The most salient political event that occurred recently was the Supreme Court's ruling on Obamacare, which upheld the law. However, it's unlikely that the ruling helped Obama in the polls--at least, not yet. Romney's peak was June 22nd, and the numbers started moving in Obama's favor before the ruling, which was announced on June 28th. Obama's best polls were conducted just prior to the 28th, or finished on the 28th. The three polls released after the ruling suggest a tied race; they're similar to those just prior to the ruling, or are slightly better for Romney. Obama has only just taken the lead in the average because, as with all moving averages, it takes a few days for the older polls (which were better for Romney) to fall out of the "ten most recent" list and be replaced by newer polls. Another possible explanation that can be ruled out is the influence of different pollsters. When pollsters are compared to each other, some tend to show more favorable results for Obama and some more favorable for Romney. This unintentional, but persistent, bias is known as a "house effect." A house effect only refers to the bias of a poll compared with other polls; until the election, one cannot know which is the "correct" number. Some poll analysts suggest that Rasmussen and Gallup, which release daily tracking polls, have tended to have a right-leaning house effect this cycle (or to put it another way, other pollsters have a left-leaning house effect). If so, it suggests that a poll average may be tilted if other pollsters aren't releasing enough polls. While it's true that non-Rasmussen/Gallup pollsters released more polls toward the end of June, which could have been to Obama's advantage, that can't be the full explanation: Obama started doing better even when comparing Gallup polls to earlier Gallup polls, and Rasmussen to Rasmussen. Adjusting for the fact that it's a registered voter poll, Gallup in mid-June showed Romney leading by 4, 5, and 3 points (June 16th, 19th, and 22nd). The two most recent Gallup polls had Obama leading by 2 points (June 28th and July 1st). The Rasmussen polls for the same days have R+3, R+2, and R+5 in mid-June and D+1 and R+2 most recently. Thus, Gallup had a 6-point shift toward Obama, and Rasmussen had a shift of two and a third points. Indeed, the change in these tracking polls accounts for much of the movement. So if the pro-Obama shift can't be explained by the type of poll or by the Obamacare ruling, what can explain it? Unfortunately, in this case, there isn't any obvious explanation. One possibility is "statistical noise," which refers to the natural up-and-down blips that can be found in any set of data. Using an average of many polls helps reduce the effect of "noise," but it can still be present, particularly in a close, three-point race such as this one. The only way to be certain is to continue following the polls to see if the trend continues or reverses itself.